“Ebola and the need for restructuring pharmaceutical incentives,” authored with Abraar Karan, Journal of Global Health, Volume 5, Issue 1, published online February 11, 2015. “What The EU Could Do To Eradicate Ebola,” Social Europe, January 6, 2015. “The Health Impact Fund: a new paradigm in pharmaceutical innovation” in Contributions to Science 10/1 (2014), 23–28. “The Health Impact Fund: a Mechanism to Improve Access, Innovation and Delivery of Medicines” in Policies for Equitable Access to Health, March 20, 2014. “Medicines for the World” in Policies for Equitable Access to Health, June 3, 2013. “A cure for all ills of the pharmaceutical benefits scheme,” authored with Danielle Celermajer, in Sydney Morning Herald, March 7, 2012. 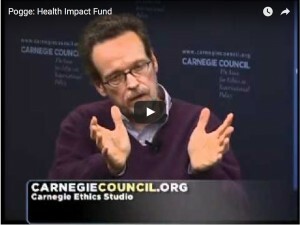 “A Response From The Authors Of The Health Impact Fund” in Intellectual Property Watch, October 3, 2011. “The Health Impact Fund: a better way to reward new medicines” in On the Human – a project of the National Humanities Center, September 4, 2011. “Making an impact,” authored with Olav Gjelsvik, in Public Service Review: European Science & Technology, issue 10, pp. 206–207, 23 May 2011. “How the poor can pay for life-saving medicines” in The Guardian, Global development, Poverty matters blog, April 7, 2011. “A novel idea to spur life-saving drugs,” OpEd with Peter Lindsay, in Atlantic Journal Constitution, Tuesday, September 21, 2010. “Making malaria pills profitable” in University Post, University of Copenhagen, July 20, 2010. “Innovative Health Impact Fund aims to save lives,” authored with Sinead Deery and Aidan Hollis, in Edmonton Journal, Saturday, January 30, 2010. “The Health Impact Fund,” an exchange of views with Pfizer Executive Managing Director Philip Hedger, in Providing Medicines For The Poor, Chemical and Engineering News 86/48 (December 2008), 33–40. “The Health Impact Fund: Boosting Innovation Without Obstructing Free Access,” The AstraZeneca Lecture of 2008 EPHAR (The Federation of European Pharmacological Societies) Congress, Manchester, England, UK, July 17, 2008; abstract in Fundamental & Clinical Pharmacology Volume 22, Issue Supplement s2, August 2008, p. 4. “A Prescription for Change” in RSA Journal 154/5529 (June 2007) 45–47. “A New Approach to Pharmaceutical Innovations,” posted 21 June 2005.